A. General Reference Books. General reference books and materials (encyclopedias, dictionaries, atlases, etc.) shall be for room use only. General reference books may be issued for classroom use upon the request of a faculty member, but these shall be returned within the day. B. Theses, Dissertations, and Periodicals. Theses, dissertations, and periodicals shall be for room use only. However, faculty and officials of the University may borrow a periodical, other than the latest issue for a period of not more than one (1) week. C. Reserve Books. Reserve books (required reading materials for courses offered during the semester/ summer) shall be lent for room use only and recalled two hours after issue. It may also be borrowed for overnight use. It can only be checked out at 3 PM and beyond and be returned not later than 9:00 A.M. the next working day. D. Circulation Books. Books for home use are usually loaned for one week. E. Special Collections. Special collections (rare books, personal papers of the Filipiniana and Archives Sections, AV materials, microforms, diskettes, art collections, and certain types of Fine Arts books, etc.) shall be for room use only. The use of archival materials, such as: official records, personal papers, manuscripts, diaries, legal papers, memorabilia, etc. shall be subject to any restrictions that may have been imposed on particular records by the originating office of the University of the Philippines System or the donor as stipulated in the deed of donation. Members using special facilities, such as microforms, computers and the media resources, shall be assessed prescribed fees. Free use. Alumni, former faculty members and students honorably discharged from the University may be allowed to use the library for five (5) days free of charge within a semester. They are issued special permits by the duly authorized staff of the college/unit library they would like to use. Beyond five days, they will be asked to pay library fees. Fees. Beyond five days the following fees are charged : Php20.00 per day; Php450.00 per year. Upon payment of the fees, they are issued special permits by the duly authorized staff of the college/unit library they would like to use. Letter of Introduction or ID. The above users must present identification cards or letters of introduction from a University personnel or a U.P. Alumni Association ID when applying for a permit to use the library. 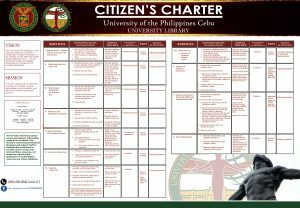 Graduate students must present an endorsement letter from their librarian requesting privilege to use the UP Cebu Library, and their school/university ID. Private researchers must present a letter of request to use the UP libraries from their offices, and their office IDs. Government researchers must present a letter from the head of their agency requesting privilege to use the library, and their office ID. They may be allowed to use the library free of charge up to five (5) days per semester. Beyond five days they will be assessed library fees. Fees. Graduate students and private researchers are assessed as follows: Php50.00 per day; Php450.00 per semester; Php350.00 per summer. Government researchers are assessed as follows: Php20.00 per day; Php450.00 per semester; Php300.00 per summer. Library permit. In all cases, the authorized library staff should issue a special library permit. If however a student/faculty/staff has an overdue loan(s) he may not be allowed to borrow another item until he returns the book(s) and pays the fine(s) even if his total charges are less than the maximum (5 or 10) allowed. A record of withdrawal shall be made of every material of any kind taken from the library. Any person who draws a book or periodical from the library shall be held accountable for it until its return. Since 2008, the University Library no longer issues borrower’s card. Your e-Library Card will be provided and conveniently accessible online. You may consult your Library transaction records by logging into the iLib using I.D. Number ( without -)as username and password. If you want to change your username and password, you must refer to any library staff for the changes. Failure to Return a Circulation Book. Any person who fails to return any book open to general circulation on its due date or after recall shall pay a fine of Php2.00 a day, exclusive of Sundays and holidays. Failure to Return a Reserve Book. Any person who fails to return a reserve book shall pay a fine according to the following schedule: For the first hour or a fraction thereof after the hour appointed for return, one peso (Php1.00); for each hour after the first, five pesos (Php5.00); for each full day, fifty pesos (Php50.00). A second offense within a semester shall automatically suspend/curtail this privilege for the rest of the semester or summer. Failure to Return a General Reference Book and Other Restricted Materials Borrowed for Photocopying Purposes. A person who fails to return a general reference book and other restricted materials borrowed for photocopying purposes shall pay a fine of Php50.00, on the second offense the person shall have his library privileges suspended for one week. Violations of the Use of Special Collections and Archival Materials. Violation of the rule on the use of special collections and archival materials shall mean suspension of library privileges not exceeding one month. Loss of a Circulation Book. Any person who loses or fails to return a book within seven (7) days after due date or recall shall either replace it with the same title, or pay its current replacement value, or replace it with another title to be selected by the librarian. In all cases, the borrower shall pay a fine equivalent to 50% of the cost of the book. Loss of Periodical. Any person who loses or fails to return a periodical after recall shall either replace it with the same title and issue number or pay its current replacement value, and pay a fine equivalent to 50% of the cost of the periodical. the libraries are conducting their mandated annual inventory. Any bona fide member of the University who loses his identification card shall report the loss immediately to the College Library. An application for a duplicate identification card shall be made with the Registrar’s Office and presented to the College Library for proper validation. Any person who falsifies the identification card shall, after due process, be suspended from the University for not more than one semester. Any person who uses an identification card not his own shall have his library privileges suspended for not more than one semester. Any person engaged in disorderly conduct such as drunken behavior creating disorder, disruptive behavior, e.g. excessive noise, loud discussions etc. ; or improper behavior, e.g. smoking, eating within the library premises shall be asked by the Librarian to leave the library premises and shall be subjected to suspension of library privileges for not more than two weeks. Any person who shall deface, mutilate, appropriate for himself, or steal any library material or property shall replace it or pay its current replacement value and pay a fine of not less than three hundred pesos (Php300.00) but not more than fifty percent (50%) of the current cost of the book whichever is higher. This is without prejudice to the imposition, in appropriate cases, of an additional penalty of suspension or expulsion to be imposed after due process, by the Chancellor upon the recommendation of the University Librarian through the Dean.